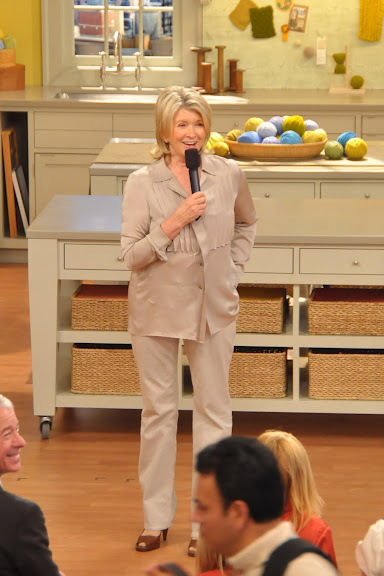 Most of my friends, perhaps blog friends too, know that I really, really LOVE Martha Stewart. OK maybe I don't have a crush on Ms. Stewart, the 68-year-old American business magnate and "homemaker extraordinaire" (even tho she's not bad looking for a woman her age). But I LOVE her brand. The style, the recipes, the projects, the quality, the creativity, the overall class. I will fully admit that I absolutely love it all! 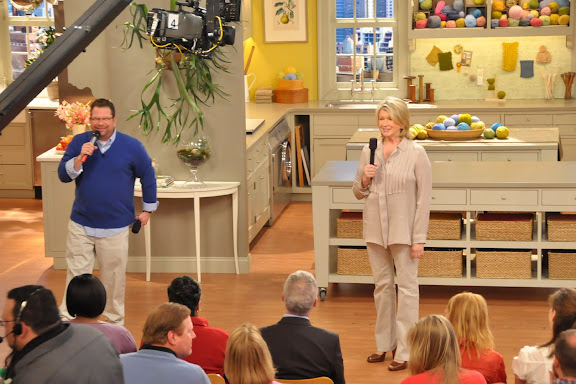 Well this time I wanted to see the Martha Stewart show. 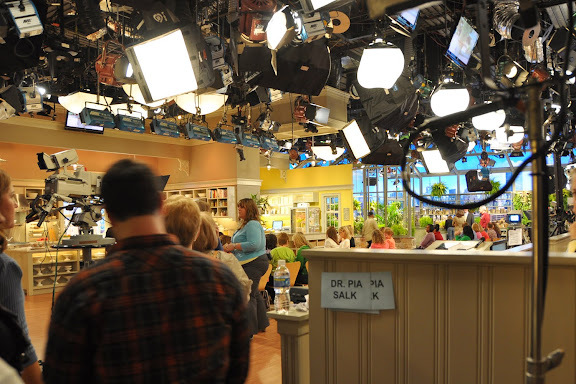 Her show is the only "daytime talk show" I record every day and watch probably 3-4 times a week all the way through! My trip was planned too last minute to request tickets online. So I had to do the Standby ticket thing. But, when I was trying to dig up information about this before my trip, I had a tricky time. 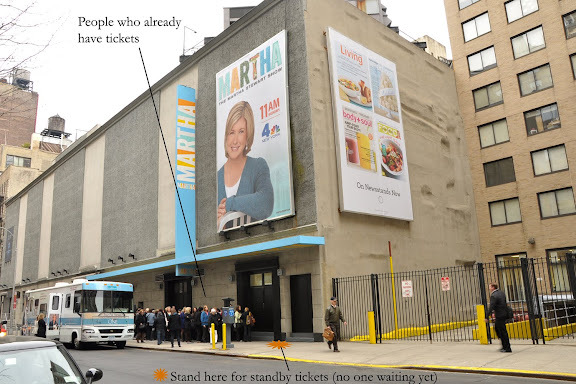 THEREFORE - I'm going to tell any and all of you how I got standby tickets to the Martha Stewart show, if you so desire. If you could not care less about this - please feel free to hold tight for my next post. The day before I tried to get tickets, I called (917) 438-5999 for some automated information. 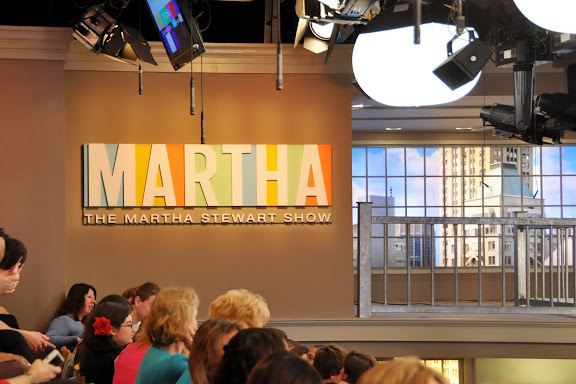 Then called (212) 727-1234 to talk to a person who told me that Martha would be filming on Thursday. I'd wanted to double check because the first day I tried for, which was a Tuesday and therefore typically a filming day, they weren't filming. Nor were they on Wednesday. So it's a good idea to confirm! 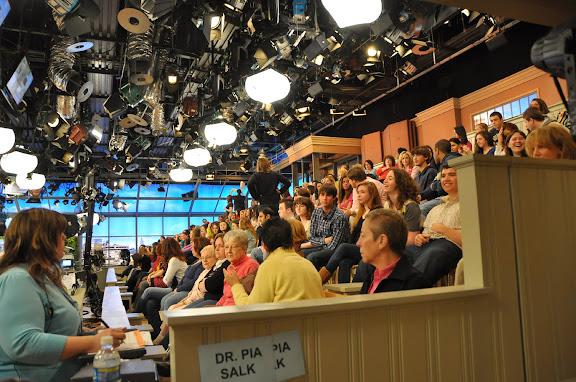 The show is filmed at Chelsea Television Studios - 221 West 26th Street (between 7th & 8th Ave.s). I'd suggest you get to the studio 2 hours before the show. So 8am for a 10am show and 12pm for a 2pm show. I suppose it wouldn't hurt if you were even earlier... 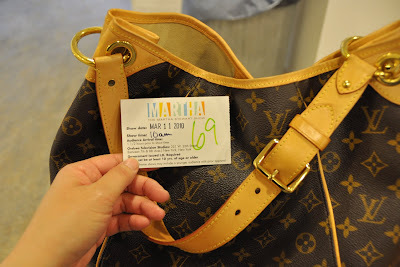 I got there around 8:10am and was the 3rd person in line (on a Thursday in March). Supposedly rainy days have the best probability of standby tickets (big surprise) and holidays are the hardest. The day I went there were ~8 people total who waited and all ~8 of us got in (and I think there were at least a few more tix too). Bring a photo ID!!! Oh and they prefer you wear bright colors - not black. I stood there on the sidewalk, where I put the orange star and eventually a staff person peeked out of those black double doors and asked if I was there for standby tickets. There were actually staff people swarming all over keeping the people in check, so it was pretty easy to ask what the deal was. The girl who asked if I was waiting for standby gave me a paper with my position # on it (Standby 1, Standby 2 etc.) and asked me to return at 9am to confirm whether they'd have tickets or not. So I went to Brooklyn Bagel & Coffee Co. (the highest rated coffee shop in the area on Yelp) at 286 8th Ave (between 25th & 24th) and got myself some breakfast and a cup of coffee. Just enough time for this - it was a perfect morning! At 9am I returned to the double black doors. All those audience people were inside getting "warmed up" by Joey Kola so it was quite a different scene outside. I had chatted with some local women in line and they said getting standby tickets is really the better way in their opinion since the people with tickets get "held hostage" by the show for that hour while we're out sipping coffee and nibbling on bagels. I suppose I wouldn't have minded that in order to be guaranteed a spot though. But fortunately this morning, they told us that we all were going to be able to get in! Yay! Standby tickets!! I had success!! I got my ticket! I'm in!! We were ushered in those double doors, given a ticket and sent through a metal detector. There was a coat and bag check but you can keep your purse with you - it will fit under your seat in the studio. 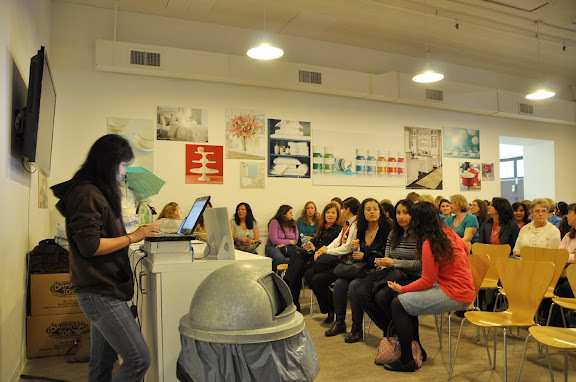 Then we hung out in this "waiting room" where all the rest of the audience was already inside. There were souvenirs for sale; t-shirts, sweatshirts, aprons, cookbooks, tote-bags, umbrellas, rain slickers (I'm guessing items are seasonal) and they took credit card! Taking orders for Martha goods - cookbooks, t-shirts, sweatshirts, totes etc. They started calling people out by ticket number, lined them all up and walked them into the studio in ticket number order. By the time we standby guests went in (we were of course all at the back) they were basically using us to fill empty spaces between groups already seated. So if you come with a friend you might be separated in order to get those standby tickets. This is what I saw as I came into the studio - it sure looked familiar! Joey Kola and Joey Meade, the stage manager went over the rules and what we had to do -- like how loud to clap and how to fade out etc. Really complicated type stuff! Joey Meade (stage manager) showing us the sign for '5 seconds to start'. Brilliant! *YES* it's okay to bring a camera and take pictures at any time inside the building EXCEPT when they're filming in the studio. You can take pictures before and after (they're very clear about all this when you're there). So all the pictures I got are "legal". None of them were sneaked! Oh how many hours I've gazed at this set - but from my own couch! We watched the show, clapped, laughed and "mmm-ed" when necessary, and enjoyed ourselves. The show goes by very quickly. This particular show aired the same day, only 1 hour later at 11am. 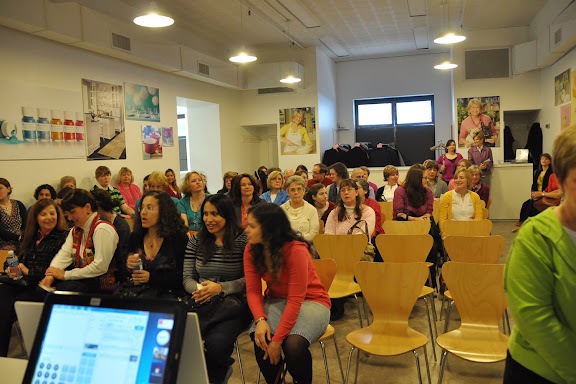 After our show, Martha answered 3-4 questions from the audience (this part was not filmed). No one was prompted or anything so the questions really were just plain ole questions people had. 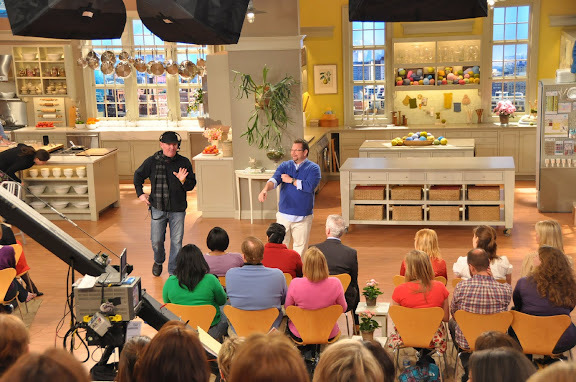 And finally they filmed 4-5 quick promos for both upcoming episodes and little bits for new products (like her new paint line with Home Depot). We were done and leaving the studio by 11:30am. I can't believe the heels they make her totter in all over that stage! Oh how I wish I didn't have to fly out that same afternoon, 'cuz as we were leaving we were told that there were more standby tickets for the 2pm show as well!! Is it sad that I could have spent a whole majority of my day watching Martha tape her shows?! Yes. But I'd still do it. Next time... I really do ♥ Martha!